Home » Baby Girl Born in a Zoo! 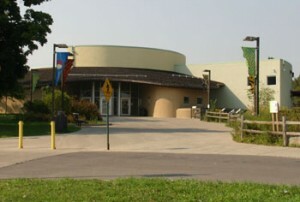 Being trained animal keepers, the zoo staff of Rosamond Gifford Zoo in Syracuse is used to handling animal deliveries. But on Friday morning they were in for a surprise when a woman gave birth inside the zoo! Zoo Education Coordinator Liz Schmidt was at the reindeer exhibit with three five-year-olds and their parents when she got an urgent call. It was 11 am on Friday morning and she was told that a woman was in labor just 500 yards away, near the bear exhibit. The 21 year old, heavily pregnant woman was touring the zoo with other children and adults when she her contractions began. The children were led to the lion exhibit while a few other adults attended to her. Liz says that she has taken training in baby deliveries but she does not usually carry the medical equipment or supplies with her normally. Liz came to help the woman and also radioed for more assistance and medical kits. A family member of the new mom had already called 911.The dispatcher spoke to Liz to help her with the birthing process. “They asked me to look for the head, so I was looking for the head and they asked me to remove any clothing that might be in the way…as soon as her water broke, it was fast after that,” said Liz. Zookeeper Sarah Kohler arrived next. The women visitors among the group and the zoo staff handed articles of clothing to keep mother and daughter warm. “The mother was remarkably calm and me and Liz gave an exchange when we saw the baby take its first breath, it was heart taking to know the baby was going to be okay,” Sarah told 9wsyr. John Moakler, the zoo’s elephant collection manager helped coordinate and divert the crowd that had gathered and moved them to other exhibits as the mom gave birth. Soon after Rural Metro took mother and daughter to a nearby hospital. Zoo Director Ted Fox said he, county parks Commissioner William Lansley, and county Executive Joanie Mahoney were proud of the zoo staff. Fox says they’ve never had to train for a live human birth, but now they’ll think about it. The zoo also plans to send something special to the baby girl. The mom and baby girl are said to be doing fine after their wild adventure at the zoo. This will likely be a story they will the family will talk about for years to come!